We’ve all been there. Professor in the front, students sitting passively in seats arranged auditorium style. The sage on the stage (hmm, when he turns that way, he looks kind of like me) drones on following a neat little rabbit trail he just discovered. A few students are taking notes, some are doodling, others are reading for other classes, or a novel, or the news. Laptops are tuned in to Facebook. A young lady in the front asks, “Will this be on the test?” Most ears in the room perk up for a second, checking in to see if the response makes what’s being said valuable enough to shift more attention to this present time and place. What’s wrong with this scene? Many of us have been there. We decide to go from Sage on Stage to Professor Facilitator. We shelved our lecture notes (considered trashing, them but then thought twice), spent weeks curating information from the web, wrote a syllabus that laid out each day’s reading in light of a really cool question. We walked into class and scrawled the really cool question on the board, turned to the class and said, “OK, let’s discuss this.” The students stared back blankly. After a week of really uncomfortable classes, we pulled the lecture notes off the shelf, breathed a prayer of thanks that we had not trashed them and then, according to research reported by Stephen Gilbert on his TLT-SWG blog post entitled “Student’s Prefer Anonymous Passivity to Engagement?”, we gave our students what they wanted. Yes, we did. Adam Smith articulated this law over two hundred years ago. Basically he said, smart people seek to discover how they can get the most benefit through the least amount of effort. Students are people and most of them are smart enough to align themselves to this natural law instinctively. This means that faced with discovering and processing information (mostly free and easily available) for themselves or sitting quietly in a room and allowing the teacher to spoon feed them pre-processed information just in time for the test (itself designed to elicit regurgitation of the professionally pre-processed information), they will tend to opt for passive listening. In line with Smith’s articulation of economic natural law, the wisdom of human experience, refined to a high state over the past few millennia of civilization, teaches us that when faced with an overwhelming task and given the choice to go it alone or pool resources and skills to tackle it collectively, most humans will collaborate. We have found that collaboration leverages many more resources and skills than are individually available, accomplishes the task utilizing less individual effort, and significantly reduces the risk of catastrophic failure. So, whereas the active instructor passive student model gives students what they want in the moment, it fails to teach them what they will need to survive in the 21st century. They will need the ability to tackle big projects as a team and work together to get it done creatively. 4) keep trying. To have the grit to keep trying and working through the problems is what academia, and perhaps life itself is all about. Be a role model for your students. I’m curious to hear about your stories of trying something new and different, failing at it, and learning from it. Feel free to tell about it in the comments. If I could reform the way college is done, I’d mandate team teaching. Not, however, by putting a couple of professors together in a class and telling them to get after it. There’s nothing terribly wrong with that. In fact I think it is a good way, in our traditional learning model, to encourage INTEGRATION. I’m not sure that it does much to create great learning experiences though. I hear that team-taught courses are sometimes fun to watch, as faculty members compete with one another to demonstrate they are smarter, wittier, or more reasonable than their partner. I also hear that they are sometimes confusing for students, often having no explicit outcomes but seemingly many unstated ones in the mind of each professor and uneven approaches to the evaluation of student learning. I hear that faculty often enjoy working together…they feel like they get to have an engaging conversation in the classroom and they learn a lot from interacting with their colleague. I hear that they get frustrated with course management, student engagement, and the perception that their students are learning less than expected (perhaps because the faculty are learning so much more). Nope, that’s not the teaching team I’m looking for (at least today). Instead, I’m interested in a team that consists of a cognitive psychologist, a game designer, a screen writer, a content expert, a web technician, a videographer, an assessor, and a professor who specializes in the facilitative learning. evaluates student learning and course effectiveness in a way that provides both positive feedback for improvement (assessor). I’m envisioning creative collaborations among these folks that design courses that are effective in on-campus and online courses alike. The content expert and screen play writer work to create a compelling semester long story capable of leading students down the twisting and intricate paths of the course. The cognitive psychologist, game developer, and assessor work to design engaging activities that encourage students to engage the content, practice the sought after skills that lead to the creation of meaningful knowledge and create evidence of that achievement. The screenplay writer, videographer, and content specialist produce the audio, video and other media necessary to capture and engage student attention and convey the knowledge necessary to do the work. The web technician, assessor and professor-facilitator work out the practical structure of the course — how the students get at the material, instructions, etc, where they will publicly engage with one another over the course content (discussion forums, Youtube posts, Google+, etc), where and when they will engage the demonstration challenges (tests), and how the students will be assessed and feedback given. I would love to see that team at work, to be part of that creative process. The closest thing that I’ve seen to such a thing is Urgent Evoke, designed and facilitated with the help of Jane McGonigal, the World Bank Institute sponsored game promoting world-changing social entrepreneurship. I’m interested in experimenting specifically with Evoke next fall when I teach World Geography, if it’s still available. In a way, I’m calling for mashing up the likes of Urgent Evoke, Kahn Academy, Google+, Dreamworks and TED into a powerful world-changing educational force. Here’s a question for you: Have you seen similar kinds of things? Where? Is College like a pub? What do the folks paying for college expect to get? In his book Cognitive Surplus, Clay Shirky suggests that the reason people make creative amateur media contributions (photos, videos, blog posts and the like) and make them freely available sites like Flickr, YouTube, Facebook, twitter and the like has much to do with the convivial social atmosphere created by such amateur media outlets. To explain this, Shirky uses the analogy of drinking beer in a pub (or one could use eating a meal in a restaurant). He suggests that drinking beer (or eating) at home is much cheaper. But people are will to pay double for the social atmosphere and easy access to the object of their consumption. This analogy started me thinking about why people are willing to pay for the kind of education that colleges can offer, particularly when the availability of information is greater than ever and access to that information is rapidly approaching free? Like drinking a beer in a pub or eating a meal in a restaurant, people can acquire information much cheaply at home in the networked information age than what people seem to be willing to pay for the experience that earns a college degree. This suggests to me that people are not really paying for the information that they may or may not acquire in the college setting. So what are people paying for? One of the things people are paying for when they buy education from a college is socialization. People want to experience the college life. The culture of college life is reputed to be about freedom and friends, which appeals to the prospective student, and learning to behave responsibly and civilly and learning how to work with non-related adults in the knowledge industry, which appeals to parents. Indeed, college is about socializing students into the knowledge economy in an environment where failure and mistakes are acceptable, expected and recoverable. Educators expect students to make mistakes and offer opportunities for them to learn from those mistakes in large part because that’s the way the knowledge economy works. We disservice our students if we don’t challenge them, support them and hold them accountable for their performance. After all, that’s a chief reason for paying what it costs to go to college. A third thing for which people in a knowledge economy are willing to pay a premium is the certainty that the teacher is competent. People expect that because the curation of information and the learning process has been so teacher-centric in the past. However, we must re-envision the role of the professor in the free information knowledge-based economy. If find ways to properly curate the information and the learning process, the professor’s role becomes much more that of a coach and tutor. To be competent, the professor must understand the learning process, have some degree of mastery of the content, and understand where students get stuck and how to help them get unstuck. The key purpose of the professor is to serve as a guide to assist the learner in navigating the new and exotic territory of an academic discipline. 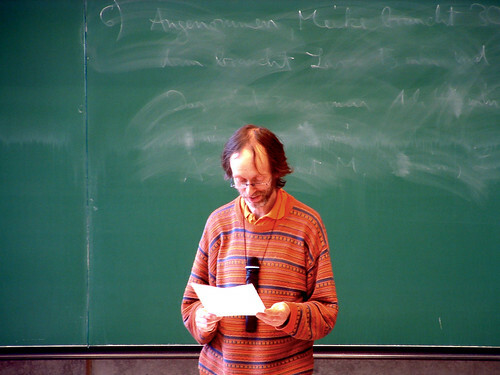 The student has to do a great deal of work and create him or herself as a curious explorer to learn the new landscape, but the professor must be there to offer technical advice about the learning process, convey and model the particular disciplinary or interdisciplinary ways to think about and work with the material at hand effectively. It is important to note that in this transitional period, the services people want is often not what they get when they enroll in a course and thus hire a field competent professor. Today’s professor, the academic historian, chemist, literary critic, economist, accountant, biologist, etc. may in fact have no clue about how to curate the learning process or coach the student through it. He or she may know a lot about the field, and if the student and field expert engage in a mentoring relationship then the student can learn a lot by watching and imitating and listening to pick up on point of view, etc. But that occurs only if there is a significant amount of interaction between professors and students that requires working together with the content under study. In our new world, as it is becoming increasingly clear that the older educational models may fall short of what the purchasers of a college education want, we must ask: is the professor willing to become a master at androgogy in exchange for employment in a teaching-learning centered college, or should the content expert serve as mentor, advisor, and colleague to the student, leaving course design and academic coaching to others or is the content experts job something else entirely. REMEMBER information is not what people are paying for but rather effective curation and guidance. The final thing people are willing to pay for is credentialing. Possessing the writ of transcript, the university can confer upon someone certification that they have learned to do and come to be what is expected of a novice in a particular field of knowledge. I use the word novice intentionally. If, as gurus of mastery suggest, it takes 10,000 hours to master a skill, and if a college major is about 45 credit hours in duration, and if the student is fully engaged, then the student practices the skills of the discipline for about 2000 hours. Since there are likely multiple skills embedded in being a historian or chemist, we have at best introduced the basic tools and showed the student how to make simple moves that can be practiced and built upon in the shop of a masterful employer. Thinking about educational certification in light of the processes used to create mastery in medieval guild systems and the time it takes to achieve it helps clarify thinking about appropriate student learning outcomes and to what point a student be reasonably expected to arrive by he end of a course or a curriculum of study. Thinking this through carefully and articulating it clearly to all constituents is key to meaningful credentialing and takes a bit of wind out of the sails of the educational critics. Learning must happen in college. Students must make intellectual progress while in college, but mastery is not something tobe looked for in a freshly minted BA. What we can reasonably expect is basic awareness of the intellectual forms that shape the view and practices of the discipline, basic skills in standard practices embedded in the discipline, the ability to continue learning and improving, and general skills in problem solving and communication. Start with this and 8000 hours of reflective work later, one may see a master. All this in mind, we must ask the question, if these are the things that people are paying for, is this what college is PROVIDING? I suggest that in many instances it is not. Major universities teach with apprentices who neither really understand yet the content nor the androgogy. Colleges have diminished the importance of androgical competence in favor of terminal degrees and/or faculty productivity. Neither of which are guarantees that a professor trained to a point near mastery in the research problems related to his discipline can curate an educational experience or effectively coach an undergraduate. Calls for better trained faculty, trained in proper androgogy, are sometimes acknowledged but he vast majority of colleges and universities devote little strategic energy to making a wholesale transformation in faculty culture or in the strategic mission of the university. In the end, if the traditional college model continues to move hesitantly to address the rapidly changing world and its new information economy, then it deserves to suffer in the face of the disruptions causes by for-profit and on-line colleges. The time is right to leverage the potential of the brick and mortar campus for the sake of the college experience and empower the student experience in that context with potent intentional educational practices that prepare students to become effective contributors to our knowledge based 21st century economy. Add completion of Google Books and Google Library…or whatever that has been or will be relabeled, and all but archival manuscripts may soon be fully on the web. Add to this that many archives are working hard to digitize and make available their collections and…well, my friends, what will we do with that edifice we call the library? There’s lots of square footage in there. More importantly, what will those librarians be doing? I love the library and my librarian colleagues. And the days maintaining large collections of paper books, no matter how aesthetically pleasing they are to hold, smell, and caress with hand and eye, are drawing to a close. But now, I need my librarian colleagues even more than I did before. After all, I could navigate the card catalog, or whatever we started calling it when it went to computer. The real need for me and my students is professional and scholarly digital curation. I can’t read all the books on a topic that I now find available. I certainly can’t keep up with the best digitally created content on the topic. I need something smarter than a web aggregator or a search engine search. Twitter is great for getting links to sometimes relevant news from my “friends” but when I get serious about information, I need a to rely on a big head, not a long tail (see Clay Shirky on institutions vs. collaboration | Video on TED.com http://bit.ly/orjyLD). I need someone smart and academic to curate introductory information sources (create topical bibliographies = books, articles, digital content). When I, a professionally trained historian, get interested in chaos theory and network science, I need something like… “Chaos Theory for the Non-Scientist” that takes me to two accessible, must-read-first books (that I will rent for 30 days for $.99) by notable folks in the field, three solid articles (that I will read on JSTOR), and an active blog site or two. And this needs to be kept relatively up-to-date. Not stale and dated like The American Historical Association’s Guide to Historical Literature (http://bit.ly/pqDjLI), which of course in its day was GREAT. To such curations, I can also point students. Why yes, thank you, I can curate in my own particular field — mostly — but my awareness of even related fields in my discipline that I once kept up on has gotten so stale that I find myself recommending students to 20 year old “classics” (are they or are they just books I read new and thought were good then?) in those fields. For instance, when some student asks about American economic history and I scan my bookshelves for something to hand her, I know somebody has surely moved past Gabriel Kolko and Robert Wiebe by now (did I say 20 year old classics?). Add to this that when one teaches broad introductory undergraduate courses, and ask students to write research papers, it would be great to have a wide array of professionally pre-curated collections to point them to once they’ve gotten through their a quarternary overview of the topic via wikipedia. This I need. For many of my colleagues in library services, I suspect that such work would be more stimulating and fulfilling than making latte’s in the library coffee bar. And I’d really use it and I think my students would to. I suppose if we can’t pull this off with our information professional workforce here in the States, Google or somebody will likely get some folks in Madras who can. I saw that as the title of a session I couldn’t go to at the Higher Learning Commission this week. And, even though I couldn’t attend it, that phase has been ruminating in my intellectual stomach for a couple of days now. I think it began to create the necessary bridge in my mind to inspire a dawning “Aha” revelation (and I know some of you are saying, “duh”). When I think about the feedback that I have given, though. I suspect it was not as constructive and useful as it could have been. Cryptic and critical editing comments, such as “be concise!” or “avoid passive voice” or “THESIS! ?” in the margins may not have provided students with feedback they could handle or use. Also, I sometimes gave (and sometimes still do give) one-off assignments. If I have students read a couple of primary sources and write a summary and analysis paper on them, and that is the only summary and analysis paper they will write for the class, there is little chance they will see reading and reflecting on the specific feedback that I provide them as important. They might glance at it, but aren’t likely to have any motivation to pour over it, reflect on it, and learn from it. In that light, it strikes me that I need to take giving feedback more seriously as a strategic teaching strategy. For this to work, I think that I will have to be more intentional about defining the habits and dispositions I want my students to develop. Then I need to design assignments that practice them in these habits and dispositions and have them do at least three similar assignments that incorporate lessons learned from previous feedback into them. I need to think carefully about what I need to point out that will help the student improve on the next assignment. Then I need to clearly communicate that. I have found that using a grading rubric helpful in speeding up the grading process. The grading rubric focuses my attention on the things that I identified as important when I created the assignment. However, when following the what is sometimes a pretty complex and time consuming approach to making a tabular grading rubric, I give up. I often get stumped trying to think of how to express the five different levels of distinction necessary to put in the boxes under gradations of performance descriptions (ie poor to great). I suppose that might be because I create more gradations of quality than is really useful (I like to use 5, when maybe there are only 3 levels of distinction that I can clearly articulate, so maybe I should just use three, until I figure out the other distinctions). Or, maybe, to make it more personal, I might use the idea presented several years ago by my colleague Howard Culbertson who used in those days wordperfect macros to create personalized letters with relevant feedback for each student. b) I like to use assignments to cause students to engage in thinking about content. Since I teach history, the flow of time covered over the course means that when a few weeks go by, I like to have an assignment topic situated relevantly within that flow. I’m sure that drafting and revision based on feedback would work great on many semester long project assignments. Summarize the main points of the feedback you received from me (or others) on your last assignment. What could you do differently, based on that feedback, to improve the quality of your work on the next assignment? In an ideal world, I would ask the student to do a self assessment of their work at the time they turn it in, too, and compare and contrast their self-assessment with my feedback. But that seems to be getting too complex. I think that perhaps the key point is I need to do a better job of providing timely, relevant feedback and find a way to engage the student in a learning conversation around that feedback and provide them another opportunity to demonstrate that learning. For more practical tips on this topic see The Teaching Professor Blog post on giving feedback. We completed the first semester of the first iteration of the SNU Arts and Culture Learning Community project. In this project we took in 40 students most of whom had a strong interest in the arts. We created a faculty team with expertise in composition, oral communication, computer applications, fine arts and literature and created a curriculum for the students that fulfilled General Education requirements in composition, speech, computing, and either fine arts or literature. The faculty taught as a team in a pair of strongly integrated courses Rhetoric I and Aesthetics. These two courses will be followed in the spring by Rhetoric II and Christian Faith and Life. Students and faculty attended co-curricular enrichment experiences related to the arts together. In the Spring they will work with students at a local economically challenged elementary school, Millwood Elementary, helping students paint a mural at their school. The faculty did a great job constructing the curriculum focused intently on student success. We chose to measure student academic success against respective university-wide general education learning outcomes, retention and student connectedness. At the end of the first semester we retained 80% of students to the Learning Community and 90% to the university. Students reported developing close friendships that transcended the class experience. Faculty reported that end of semester work in the Aesthetics course, though students were still at the mid-point of progress toward the first major outcome communication measurement, was “as good as any end of semester paper in Intro to Lit (a sophomore level course)”. The overall project was a pilot designed to demonstrate the effectiveness of integrating curricular and co-curricular activities. Early successes reported by faculty led to inclusion of an item in the university strategic plan indicating a desire to support the expansion of the project beyond a pilot. The faculty involved in the ACLC have developed into a passionate team. They’ve embraced their role as guides leading new students into our larger Christ-centered community of scholars. For the participating students, growing together into this community during their freshman year led by passionate full-time faculty who work together as an integrated team for the good of the community and supporting one another in that endeavor is as good as it gets anywhere. This is the kind of thing we can do better than anyone else, if we just will. This is the kind of thing that emerges from our core values and the identity that we share inside our community and with our constituents. It’s very different from the typical freshman experience in many places where the odds favor of having 3 or more of 5 courses in the first semester taught by contingent faculty or TAs. That happens too often, even here, due to chronic understaffing in areas that guide students in learning composition, speech, computing, general mathematical, social science, history and the general education religion/philosophy area. Again, we are not unique in struggling to meet those kinds of challenges. Yet, students in our LC project groups (thematic and Honors) are getting the best we have to offer; we are meeting their expectations; they are learning and staying. We also feel that we are providing the kind of educational experience that our students’ parents expect us to provide their children. That’s what they believe they are paying for. Being a part of bringing together these people around these values has made life great as we work together in this great cause. These faculty have created in me confidence that we can reproduce something similar to that with another team of existing GE faculty. Adding additional LCs does increase administrative burden. The participating faculty meet every week together for about 2 hours outside of class to ensure that they are providing the best educational experience. That’s extra work; they’ve done it because they believe in the value of what they are doing in the LC. They don’t get paid extra for that or load released. That needs to be addressed. Their willingness to do it arises out of their passion and their commitment. That’s a cost of doing things to the level of quality that we intend to deliver. We sure are fortunate to have these folks. That said, we need additional assets, envisioned as elements of load contributed by faculty already in the institution, to recruit new students into the next year’s program at the very time when our LC faculty are pouring themselves into transforming this year’s students, to manage evaluation and feedback of curricular and co-curricular activities to ensure that we are always making today’s best better tomorrow, and to actively recruit and incorporate additional faculty into the program, both for the additional LCs and to short circuit burnout and stagnation. These additional assets are necessary to ensure that we can do two LCs well. I believe that after we get our feet on the ground, those same assets can utilize their skills to support more than two LCs. I’m thinking maybe four, but that’s still not clear. I’m looking forward to gathering an analyzing additional data at the end of this semester comparing the academic success of LC students and that of other freshman students. In a recent Tribal Leadership Coaching Challenge course, participants were asked to distinguish between excellence and greatness. I began to think about that in light of the educational experience. One of the things that emerged among the twitter conversation on the subject (#tlcc) was that excellence is a competitive, individual aspiration while greatness is something that groups of people achieve as they work together toward a common, noble goal. In the classroom, I have seen see this happen. Some days some of my students, perhaps even many of them depending on the day, perform excellently. They aspire to do so. Those with that aspiration engage the topic, answer questions, etc. I like it when students do that. What I’ve become sensitive to, though, is that it is a very dyadic interaction, me (the prof) and one student, then another student, then another student in the presence of a class full of students. At the end of those days, I sometimes believe that I did a competent job, but I am tired from working hard managing the class, which includes trying to engage the disengaged and be encouraging, but controlling the over-engaged. I also know that there are days when I have walked out of a class saying, “Man, that was a great class today.” I feel on top of the world and so do the students. Reflecting on those in light of Tribal Leadership perspectives has led me to realize that those were days when I disappeared from the class, that is my role as classroom manager disappeared. On those days, We engaged learning together, triadic conversations developed. On those days, the synergy left me and my students energized, not drained. I’ve seen it happen and now I see my task is to develop strategies to shift the classroom culture from stage 3 to stage 4 quickly so that we can experience great days together, not merely witness excellent individual performances. I can see now why John King, one of the co-authors of Tribal Leadership is so excited and hopeful when he talks to members of orchestral and dance groups. In those settings, individual performances may be excellent, but unless everyone is working together toward a great overall performance, it’s hard to listen to or watch them. The same is true, though less obvious in the classroom.